After recent weekend events in Wiltshire (2015) and Cornwall (2013), this years weekend event is heading back to the Isle of Wight to explore some of the sites we missed out in our overseas tour of 2011. Our colleagues on the IOW have planned an action packed weekend of visits with a wide range of historical sites, dating from the distant Neolithic past to the recent Cold War years and lots inbetween. 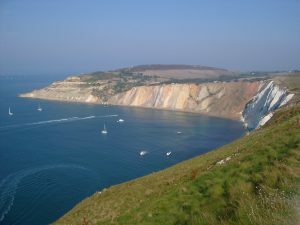 Something for everyone and a warm welcome from local experts, eager to show us the rich history of the Isle of Wight. The CBA Wessex weekend events have proved very popular and are an excellent chance to socialise and see some amazing sites in good company. Saturday 15th September: Tours of Quarr Abbey and recent excavations at the Benedictine Monastery, which is still home to a small group of Benedictine monks and the Shipwreck Centre and Maritime Museum, run by the Maritime Archaeological Trust. In the evening at the George Inn, St James Street, Newport, will be the infamous CBA Wessex quiz with prizes, followed by an evening meal. Sunday 16th September : a visit to Tennyson Down to investigate a Neolithic Mortuary Enclosure, Bronze Age Barrows, which have recently been excavated by the Citizan project and more recent sites including the Alfred Lord Tennyson monument, and WWI trenches, the late 19th/early 20th century Needles Battery and the 1950s and ’60s testing site of the Black Knight ballistic missile. Cost: CBA Members £100 and Non-members £120. Costs will include transport during the day, events and entrance fees and Friday and Saturday evening meals, but not accommodation, ferry fees and lunches during the day. Newport will be the main base and set off point for events and is the best place to book accommodation. (Please understand we have no direct experience of these and are therefore unable to rate them). If you are unable to book online then you should contact our Events Secretary at events@cba-wessex.org.uk , giving your name, contact telephone number and email address together with your choice of events you wish to book. It is important you let us know how many member and/or non-member places you require for each event.